Deciding to hike the Appalachian Trail is one of the most tangible goals I’ve ever set out to accomplish. I have learned more than I even realized there was to learn about choosing a goal and then choosing to continue to prioritize that goal in the face of everything. I haven’t “looked ahead” with such determination toward a goal since I was in college and my goal was to graduate college. At that point in my life I didn’t see every small action as a step in the right direction toward what I wanted out of life because I was living in this planned-out, career-driven world that I didn’t seem to fit into. Only recently have I gone through a great unlearning, and I realized that being career driven is not the only way to be a successful human being. I have found that I am instead driven by the pursuit of a life full of experiences, adventures, and love. 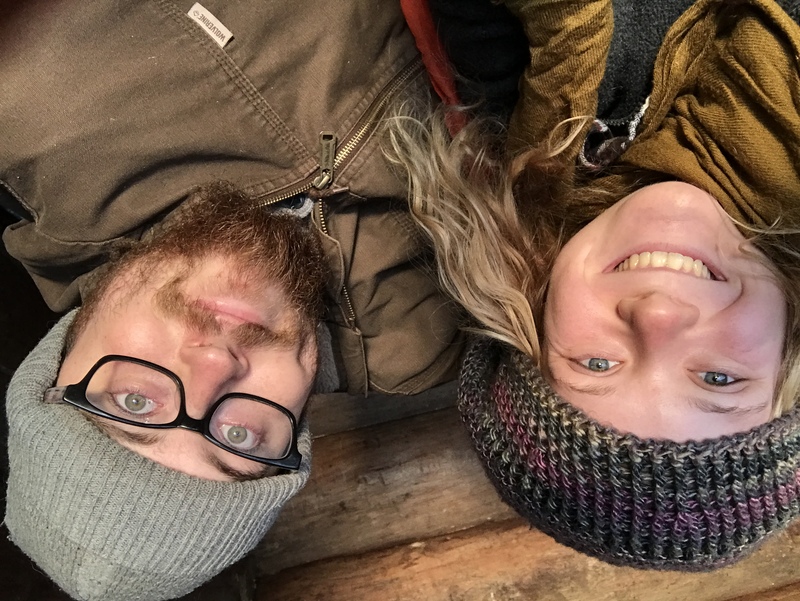 I wanted to share a few parts of my story that fit in with this overarching theme of goal setting, and how I have gained some real clarity and confidence when it comes to choosing and working toward future goals. In November of 2018, I spent five days alone on the AT. Just a few days back in my office after that brief stint of freedom and I was already growing cynical again about the politics in my place of work, and about what in the heck my purpose even was. I was resentful toward the 37 1/2 hours a week I spent closed up in the same room to make money to pay my bills—wash, rinse, repeat. None of it made any sense to me. It was winter; I was cold, bitter, heavy and unmotivated. 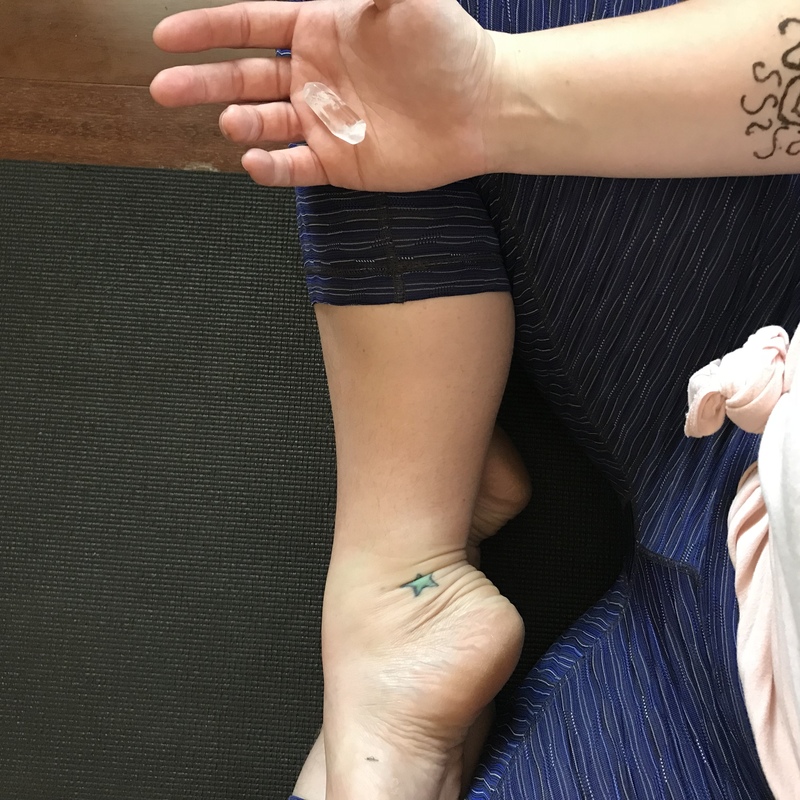 Sitting on one of the windowsills in my office, I kept a small, clear quartz crystal that was given to me during yoga teacher training. One morning during those first few hard days back at work, for no reason in particular, I picked up the quartz and held it in my palm the entire day. Over the next several days I continued to carry the crystal around, not really sure why other than it felt good to have it with me. The very next day I was sitting in my van when I opened the letter from the bank that listed all the reasons why I would not be getting any kind of loan anytime soon. I felt a flourish of activity in my stomach, staring at the letter, remembering what I had said the night before. The same clear quartz was sitting right there in the cup holder as I began to process it all. 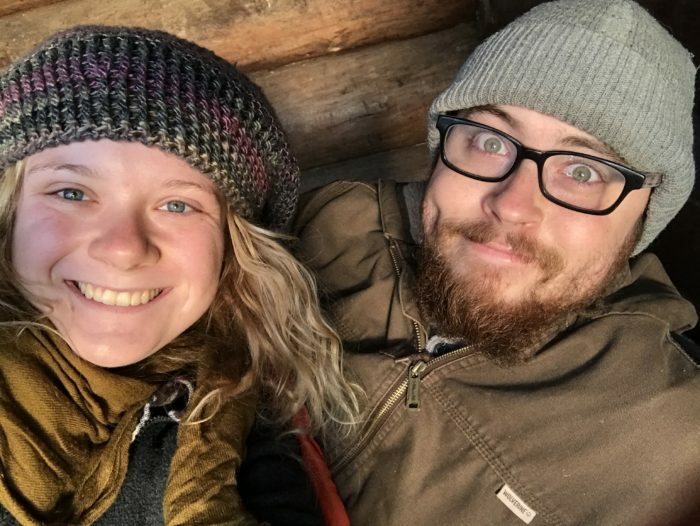 I kept the news to myself for several days until finally, when random people would ask how my last hike had gone and when my next trip would be, I started telling them I was hiking the whole AT in 2019. I was saying it before I even believed it myself. But the more I spoke it, the more real it became, until ultimately, I asked Burt what he thought of the idea and he gave me his full and devoted support. Once my partner was on board with the idea, it was officially a full-blown goal. Burt and me on a section hike of the AT in January 2017. 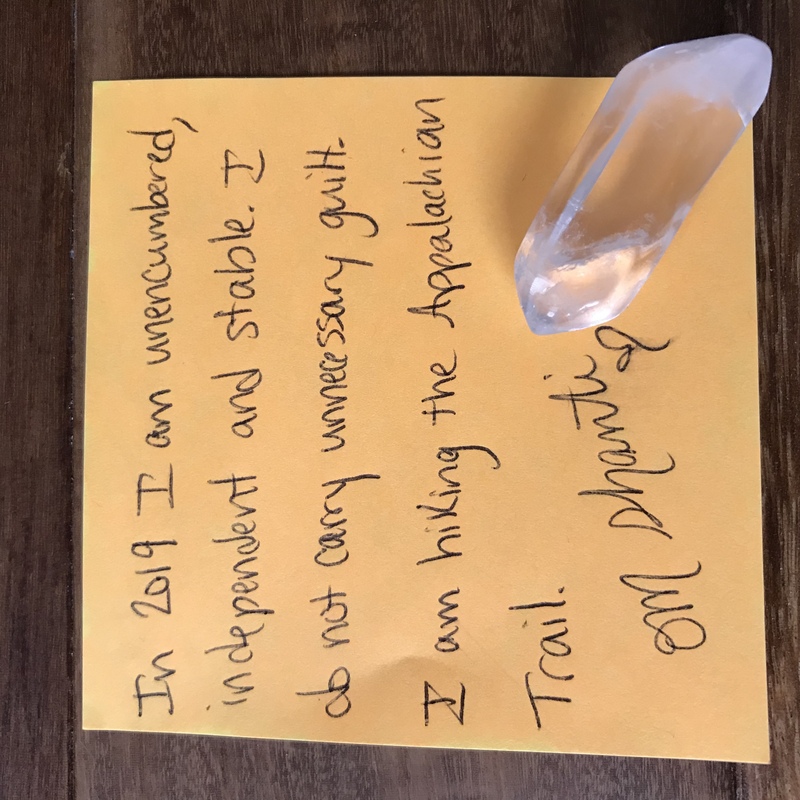 The crystal became a tangible thing I held onto in order to remind myself that every choice I made had to be a choice that was moving me in the direction toward my chosen goal. I hold it as I take a sometimes uncomfortable amount of money out of each pay check and put it in my savings. I hold it when I really want to go out to eat, but I decide to stay home and eat rice and veggies—again—to save money. I hold it when I feel like being lazy but I decide to get up and hike or run instead to keep my body in shape. I was holding the crystal when I told my mom over the phone that I couldn’t go to a Queen concert with her in August because I would be a little busy hiking the AT. I was holding the crystal as I sat across the table from my wonderful boss and nervously told her my plans to leave her and the rest of our team so I could “selfishly” follow this dream. I still carry it everywhere with me; it is very charged with this intention of mine. And I plan to have it with me all the way between Georgia and Maine as my tangible reminder to stick to this goal. My 2019 mantra, intention, resolution, whatever you want to call it. This is the phrase on repeat in my head. I burned this sheet of paper at midnight on the night of the new year while sending prayers into the universe. It’s a big deal to step away from the obligations of work, family, and life in general for half a year to pursue this, admittedly, selfish thing. I’m not doing this for anyone else. I’m doing it for me. So step one is to let go of the guilt that comes attached to the word “selfish.” Let it go. Let it go. Let it go. I am not a terrible person for doing something big just for me, and neither are you. A few months before I made the solid decision to do this, my beloved grandma’s health went into a serious decline. I’m facing the hard-to-swallow truth that we may lose her while I’m gone, and it hurts. It hurts more than I can put into words on the internet. It has caused true inner demons to surface and demand to be felt and dealt with. But I can’t let it change my decision. There will never be a “right” time. There will literally always be some kind of reason not to go; and that is the painful part of sticking to a plan. Although I feel very good about my decision, it doesn’t come without sacrifices or inconveniences or whatever. Choosing a goal means also choosing to endure all the hardships that come along with it. For better or worse. I’ve barely left the little town I live in for the last four months because it saves money to stay home; all my friends are making summer plans, and Halloween plans, and plans to go see epic bands in concert, and I can’t be a part of any of that. I’m wearing the same five or six outfits to work week after week because the only money I’m spending on clothing is the money it takes to buy all my clothes for the AT. All good things come with exciting and inconvenient details. My job is to embrace and experience it all for exactly what it is. Get clear and intentional. Your goal should be one that feels good to your core—one that you are confident enough to defend when naysayers want to discourage you. (There will be naysayers.) If you are sending mixed signals about what you want out into the universe, how can the universe know how to support you? Use a tangible object to keep you focused. Big goals that take time to achieve are really just a long series of big and small decisions strung together that either propel you toward or drag you away from your goal. Something that you literally hold in your hand can help you remember what direction you want to be going. Use positive, present, and specific language to create a mantra. 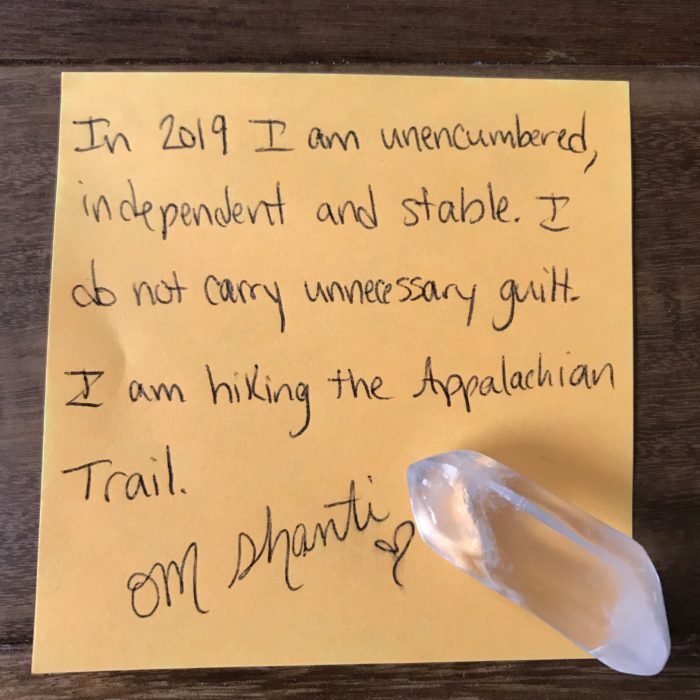 “I am hiking the whole AT in 2019.” Is much more powerful than, “I will hike the AT.” Choose your mantra, repeat it constantly. Remember your happiness is your responsibility, and everyone else’s happiness is their own responsibility. If that statement triggers you and makes you think, “Wow, she’s really selfish,” (There’s that word again.) that’s OK. If you reflect honestly, you might find that you do not prioritize yourself enough. I know you feel the weight of watching over and protecting all the people and things that you watch over and protect. But who is watching out for and protecting you?